Macdonald Rusacks Given Go-ahead For Luxury Suites And Rooftop Restaurant. 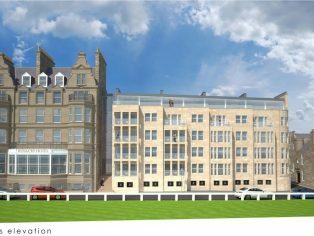 Visitors to St Andrews will be able to enjoy the most famous view in golf from some of the most luxurious accommodation in the country after Macdonald Hotels were this week granted planning permission for a 44-suite extension to the Rusacks Hotel, overlooking the 18th green at The Old Course. The £7 million extension to the 128-year-old hotel in the ‘Home of Golf‘ will also include a rooftop restaurant, bar and terrace, as well as glass-fronted suites allowing visitors to witness up-close the grandeur of golf’s most historic course. “This is a tremendously positive announcement for our company and for St Andrews, which will give visitors to the town world-class ‘5 Red Star’ accommodation. 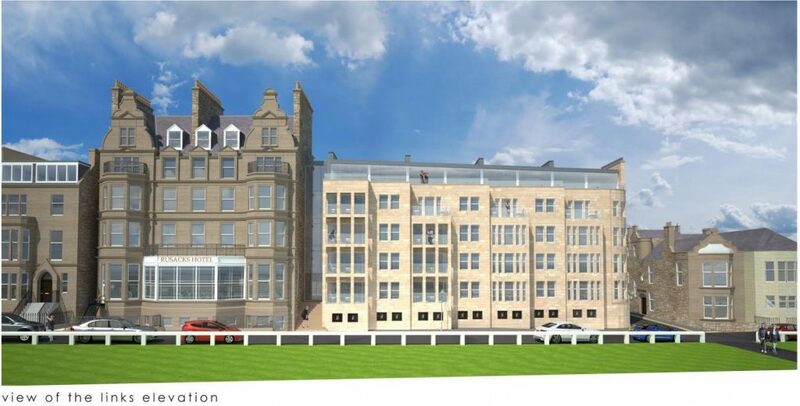 This development will set a new benchmark for luxury in St Andrews, attracting many new visitors every year from all over the world and bringing new jobs and major benefits to the local economy. We’ve owned the Macdonald Rusacks since 2001 and are especially conscious of being custodians of one of golf’s most famous locations so will be developing the site with the utmost sensitivity. Macdonald Hotels will invest £7 million in the development, with 44 spacious suites which range from 350 – 475 sq ft and a rooftop restaurant for 145 diners, building on the success of the 3 AA Rosette ‘Rocca’ restaurant operated by Adrian and Susan Pieraccini. The new restaurant, bar and 1,050sq ft roof terrace will all offer spectacular views over the Old Course and the West Sands, additions which the company is confident will achieve ‘5 Red Star’ status for the Macdonald Rusacks Hotel. The extension to the hotel, which will also provide valet car parking on the lower ground floor, has been designed by Scottish firm WCP Architects and will be built using traditional materials in keeping with its location in the historic town of St Andrews.